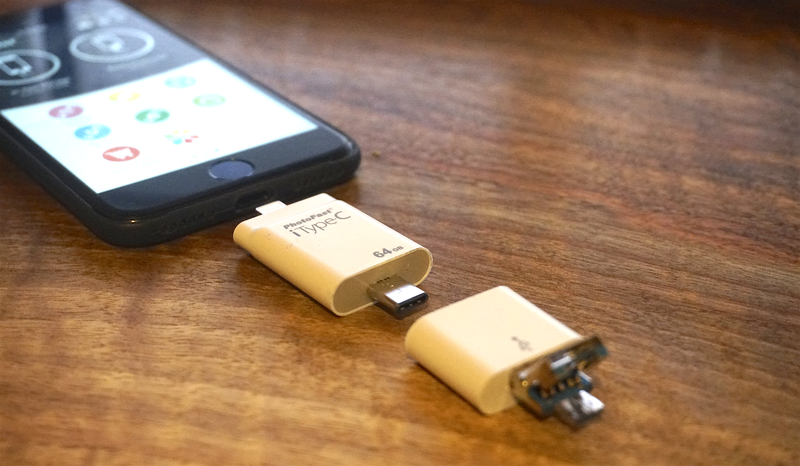 I’ve reviewed a lot of Lightning thumb drives in the past, which allow you to transfer and stream files from the drive directly to an iPhone or iPad with a built-in Lightning connector and companion app. On the other end is usually a USB-A connector to do the same on your Mac or PC, but this new Lightning drive from PhotoFast also offers USB-C for new MacBook and MacBook Pro users AND micro-USB, making for a complete solution that will let you transfer files between all of your devices. The product comes in two pieces. 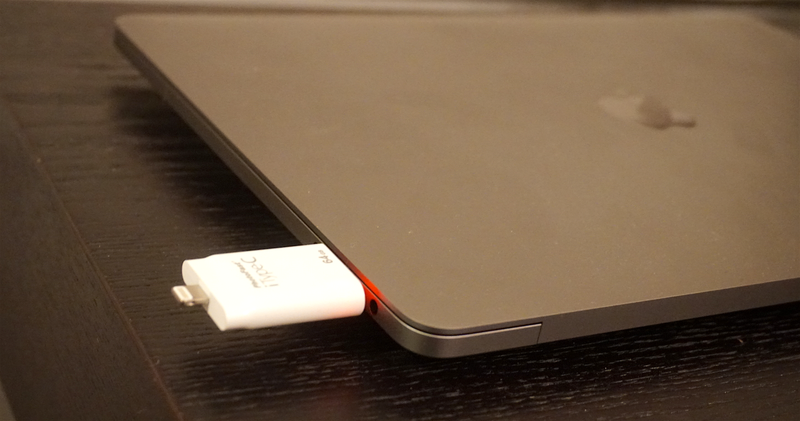 The main drive has Lightning on one end and USB-C on the other, ready to go for new MacBook Pro users or other Macs with USB-C ports like the 12-inch MacBook. 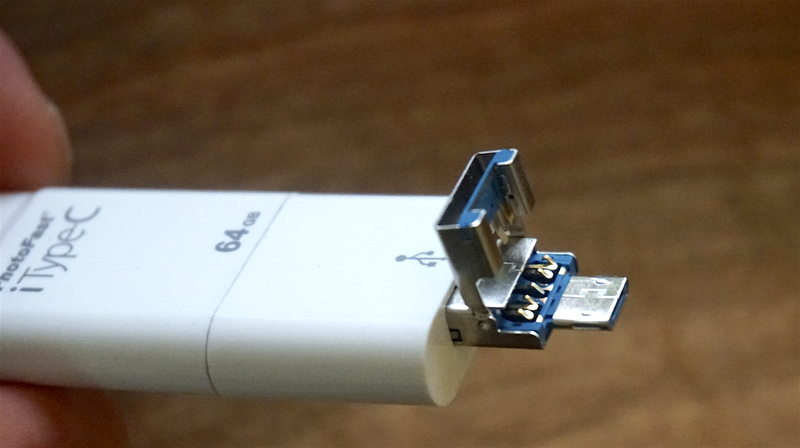 It also comes with a second piece, an adapter, that attaches to the USB-C connector to turn that end into USB-A and micro-USB. When the adapter is attached the entire unit measures 78.7 x 26 x 9 mm, and it’s about 2/3rd’s that length when just using the main unit for USB-C devices. Often I worry about these dual connectors since the folding mechanism can eventually wear out before the drive might, but the PhotoFast connector is all metal and feels built to last, as does the unit itself. I didn’t notice any loose connectors or other issues with build quality that you often run into with these 4-in-1-style products. Clear caps for all ends of the drive and adapter are provided to protect the connectors when not in use. The only thing the new PhotoFast Lightning drive is missing is an SD card slot, something we’ve seen on other Lightning drives in the past like this one I reviewed from Leef a while back. PhotoFast makes one too. 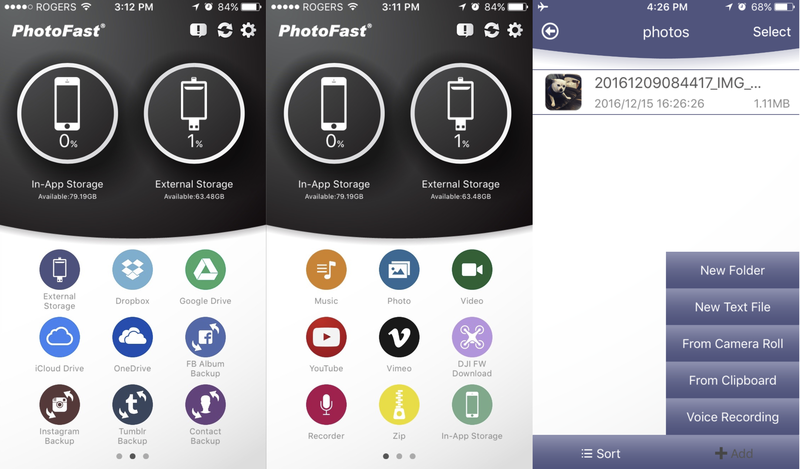 The drive works with a companion iOS app called PhotoFast One (the drive itself is also made to fully support Android and Windows with exFAT and FAT32 file system support in addition to macOS). Something that I found very interesting that I haven’t seen much of from competitors is integration with other apps and services. A built-in browser lets you search and watch videos on YouTube from within the app, and you can save videos to the drive for offline viewing with one tap! Same goes for Vimeo, and you can connect to other cloud services and social accounts like Dropbox, Facebook, Instagram, iCloud Drive, OneDrive, and more. That lets you pull in files you might want to have on the drive for offline viewing or as a backup. You can also create folders and move around files from in-app storage to external storage, etc. And there are auto-backup functions for your phone’s contacts, calendar, photos, and the your iPhone or iPad’s backups. A picture-in-picture mode lets you continue watching a video while you navigate around the app (pictured above). Also within the app is a built-in voice recorder and text editor, both of which work well enough for recording a quick note directly to the drive, but they wouldn’t win any design awards as far as the interface goes. The app supports password protection for files and Touch ID to keep your files secure if you wish, and it has the ability to zip and unzip files. The drive supports USB 3.0 transfer speeds and can handle streaming 4K video. The company has a full list of file type support on its website, but they cover the majority of the most common file types. There are other USB-C drives, and other thumb drives that have a built-in Lightning connector and USB-A or micro-USB, but this is the first Made-for-iPhone— meaning it has received Apple’s seal of approval— 4-in-1 drive that includes all four common connectors. It does so in a nicely designed and well-built package, and the companion app worked as advertised in my tests, even if it left a bit to be desired as far as user interface design. You can buy the PhotoFast iTypeC 4-in-1 Lightning drive now for $79 (64GB), $119 (128GB), and $239 (200GB).